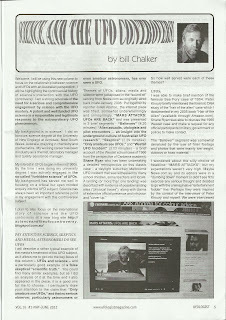 In the current issue of the Australian bimonthly magazine "UFOLOGIST" Vol.16, No.1 May-June, 2012, in my new column SCIENCE and the UFO CONTROVERSY I have written a piece with the focus: PAY ATTENTION SCIENCE SKEPTICS AND MEDIA, ASTRONOMERS DO SEE UFOs. I demolish a statement by Sydney Observatory consultant astronomer Dr. Nick Lomb where he stated "Only amateurs see UFOs," and that no serious observer, particularly astronomers or even amateur astronomers, has ever seen a UFO. Dr. Lomb, author of the recent excellent book "Transit of Venus," is an expert on astronomy, but he is clearly uninformed about serious UFO research. I recently had the opportunity to briefly met up with Dr. Lomb during an Observatory Sydney Writers Festival event. He cordially signed my copy of his book "To Bill, clear skies to see identified objects," and I gave him a copy of my column which discusses his statement and my response to it. I hope he takes the time to consider this and makes a considered response. Anyone seriously acquainted with the UFO subject would dispute Dr. Lomb's skeptical statement. For example, Clyde Tombaugh the discoverer of Pluto reported UFO sightings. Dr. Hynek undertook an early 1950s survey which revealed some astronomer's sightings, and Professor Peter Sturrock's survey during the 1970s revealed further evidence of UFO sightings by astronomers. Dr. Hynek once took photos of UFOs himself. He couldn't explain what he captured on film from a plane window. In my 1996 book "The OZ files - the Australian UFO Story" I describe a 1957 Mount Stromlo sighting, of which the assistant director of the observatory, Dr. A.R. Hogg stated, “It was the first time the observatory had sighted what might be called an unidentified flying object. What it was remains an open question." Much earlier, 1902 in fact, Adelaide observatory astronomers reported an aerial object they couldn’t identify. I describe that incident in detail in the column, focusing on an extraordinary legacy story of astronomer George Dodwell, as it has a fascinating deeper story that flows from it - Dodwell not only witnessed a UFO from Adelaide Observatory in 1902, he was in later years convinced that alien UFOs existed. In “The OZ Files” I also describe a UFO sighting made by the late Dr. John Dawe, who was the manager of the Sidings Springs Observatory. He described his sighting near Merriwa in the Sydney Morning Herald of 11 January 1995, stating it was "classic stuff ... It was something I still cannot explain. But I am 99.99 percent certain it was nothing alien." A UFO still - an unidentified flying object. Over 3 issues of the UFO Investigation Centre’s UFOIC Newsletter (No. 37, 38 & 39: 1972 – 1973) the group’s secretary at the time William Moser (also president of the local chapter of the British Astronomical Association) had his article “Astronomers and UFOs” published, listing numerous sightings by astronomers. To skeptics and astronomers such as Dr. Nick Lomb, you need to realise that some “serious observers”, indeed astronomers and professionals, do observe UFOs, and it is often the uniformed opinions of their peers that prevent the reporting of their UFO sightings. Another lost opportunity to discover something fascinating that is being reported by serious observers, not just amateurs, but a serious engagement by science of the UFO mystery could change this unsatisfactory dynamic, leading to the development of a productive field of UFO science.